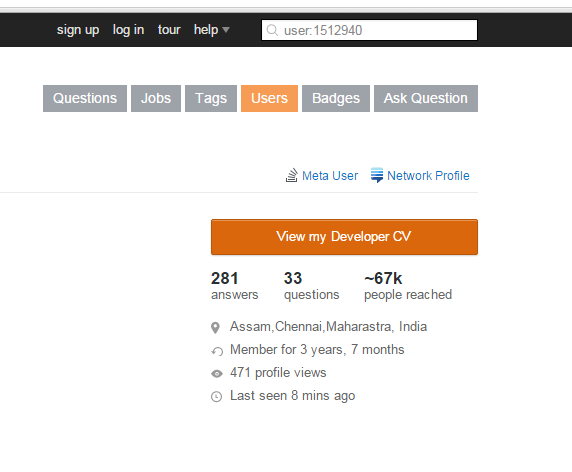 I recently noticed that when viewing other user's profile page on SO, its showing up the button "view my Developer CV" and on clicking that its taking us to corresponding user's CV page, it seems a BUG to me, it should show "View Corresponding User's CV" right ! I am attaching a Screen Shot of my profile page when I am viewing it as a guest , you will notice the text of button on right hand side is showing up as "view my Developer CV". This is written in first person. The user whose profile you are looking at is inviting you to view their CV. Not the answer you're looking for? Browse other questions tagged bug status-bydesign stack-overflow profile-page .